You know how sometimes a day — a year — can rip by in an instant? But somehow the ten minutes while the steak is resting feel interminable? Without gainful employment, that steak will draw you in, those crispy bits will dangle and taunt, that carving knife will reflect light in your eye until you succumb. 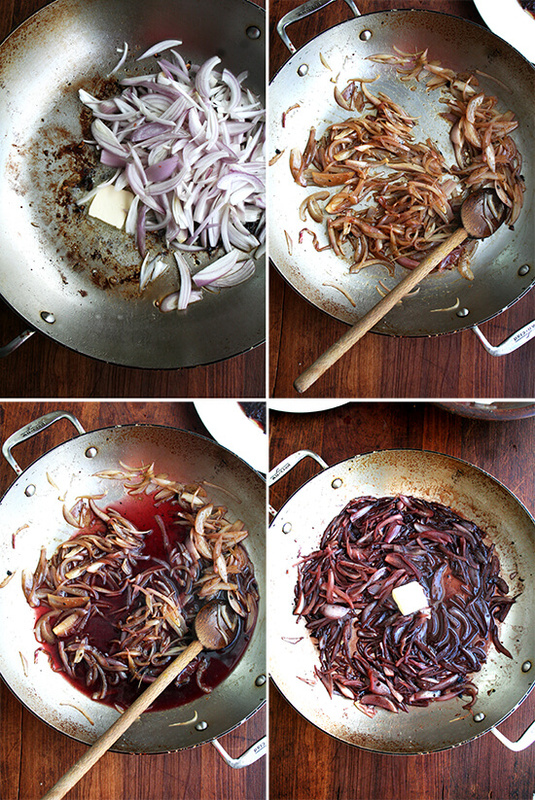 The only possible way to survive those torturous ten minutes is to stay busy, and I have the perfect distraction: make a simple pan sauce, something like this red wine-shallot reduction, a delectable Daniel Boulud recipe. Those ten minutes never will pass so quickly. That steak, at last, will rest without fear. This sauce requires little more than slicing shallots and arranging a few ingredients near your stovetop: vinegar, red wine, and butter. And it’s simple to make: as soon as the steak finishes cooking, butter and shallots sweat in the browned bits stuck to the pan; vinegar then reduces until it nearly evaporates; red wine then reduces by half. Off the heat, one more tablespoon of butter finishes the sauce. 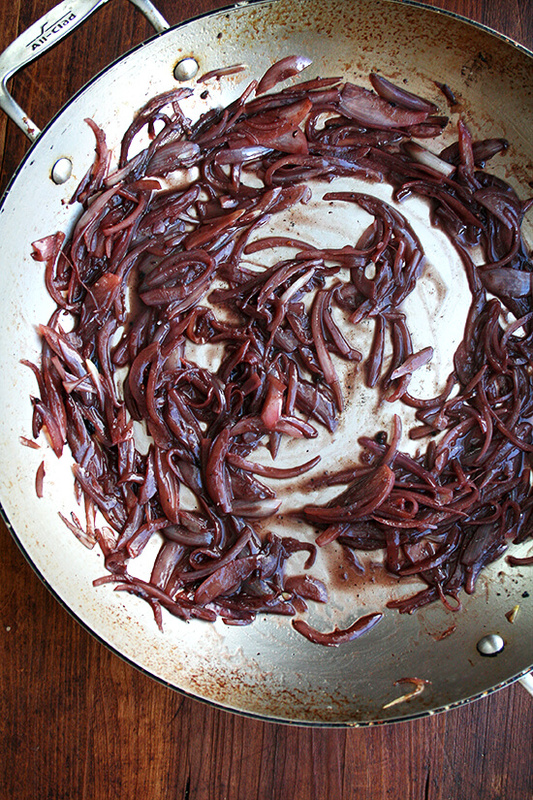 The resulting sauce is more of a compote, sweet stewed shallots with a perfect bite, and would be a nice condiment for any steak, but Boulud suggests serving it with hanger steak, a staple of French bistro menus, an incredibly tasty cut of meat, one that is nearly impossible to enjoy at home — very few markets sell hanger steak. 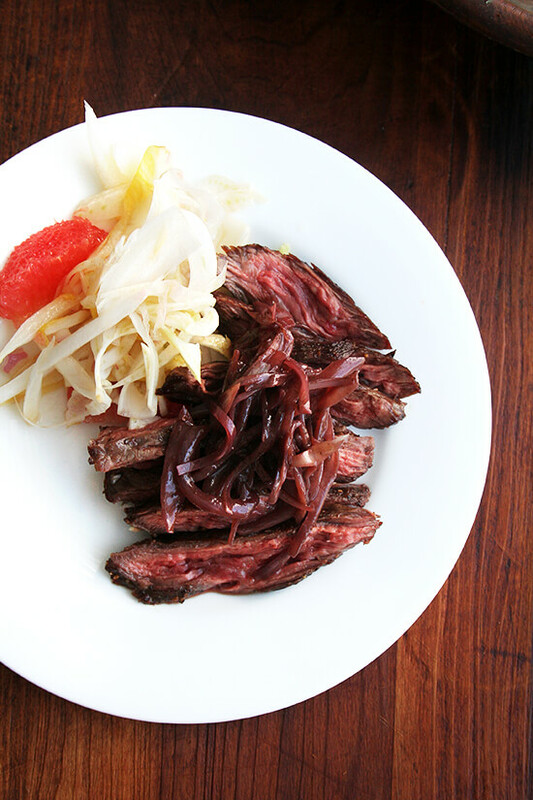 With there being only one hanger steak per steer, nearly all of the hangers go to the restaurants, and many markets aren’t even able to special order them. If you’re lucky, a local farmer might save you one, but you might have to request it months in advance. But don’t despair. 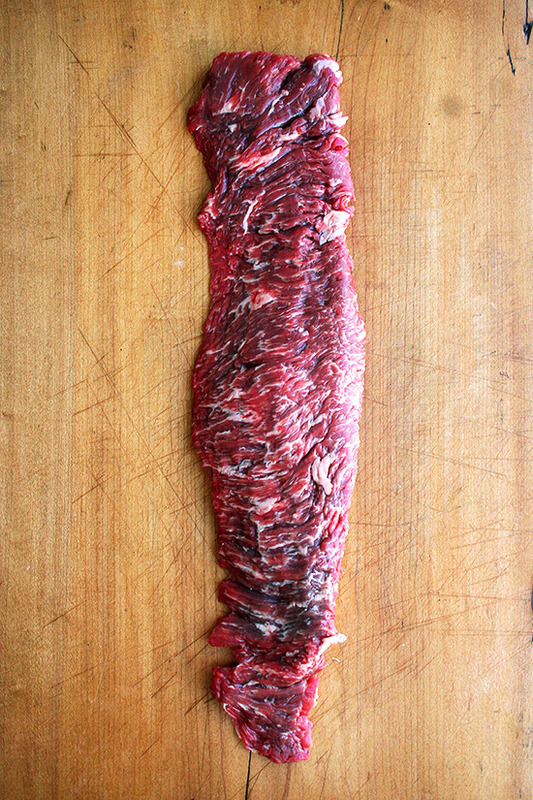 Cuts like skirt or flap steak similarly chewy — not tough — in texture are easier to find. And they are SO good — I would pick any of these cuts over a filet or even a New York Strip. They require little more seasoning than salt and pepper, and they cook quickly over high heat. Marinating is unnecessary, which means you can pick up one of these after work and have dinner on the table an hour later. If you aren’t venturing out on the town this Friday evening, this little meal might be nice for you. It’s simple but the sauce makes it feel special, and making it is fun, too. Best of all, you won’t have to wrestle temptation while your steak rests — an effortless defense is just a sauté pan away. Skirt and flap steaks are really long. If you cut the meat at the points where the thickness changes, you’ll have several pieces each with a different but uniform thickness, which will give you better control over cooking times. 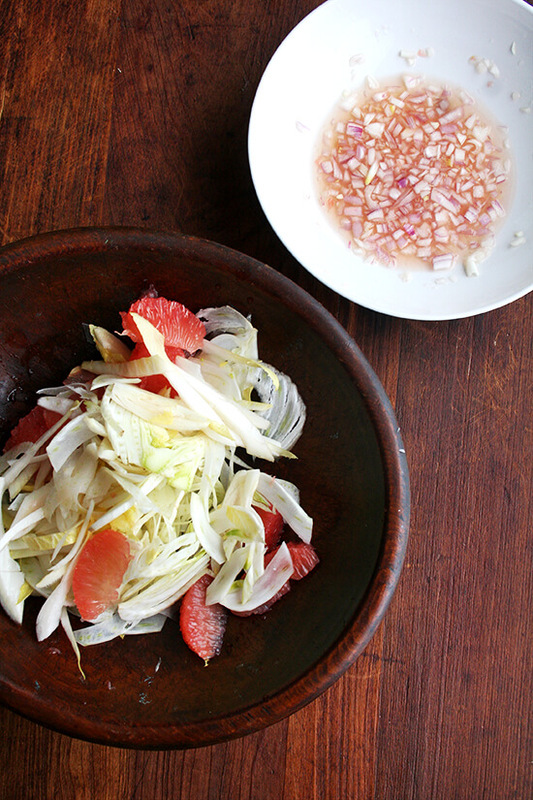 A wintry salad is a nice side dish for this steak: sliced endive, shaved fennel, grapefruit. You can make the salad while the steak is coming to room temperature. 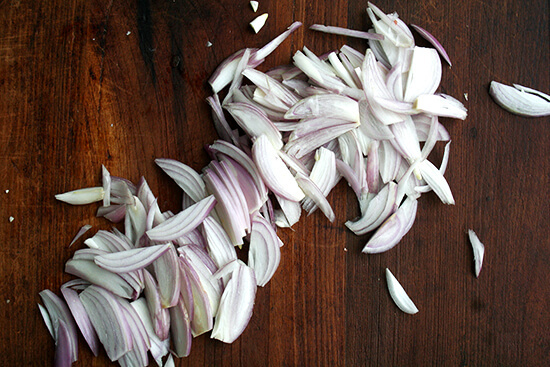 Be sure to reserve a few of the shallots you slice for the steak to use in your dressing: Finely dice a shallot or two. Place in a bowl and cover with a squeeze of fresh grapefruit juice and 1 tablespoon white balsamic vinegar. Season with a pinch of kosher salt and a pinch of sugar. Let macerate for 15 minutes. Whisk in about 1/3 cup extra-virgin olive oil. It’s ok if the dressing is not totally emulsified. Just give it a stir when you’re ready to use it. Toss salad just before serving. Note: Depending on where you get your skirt or flap steak, it might be cut into smaller pieces or it might be in one long piece. If it is in one long piece, cut it at the points where the thickness changes to ensure more even cooking. If you like garlic, you can rub some over the steak, but know that it will burn when you are pan searing it. A little charring is fine; a lot is not recommended. If you use it, be sure to rub most of it off before searing. Also, skirt steaks are thinner than flap steaks and as a result will cook faster. 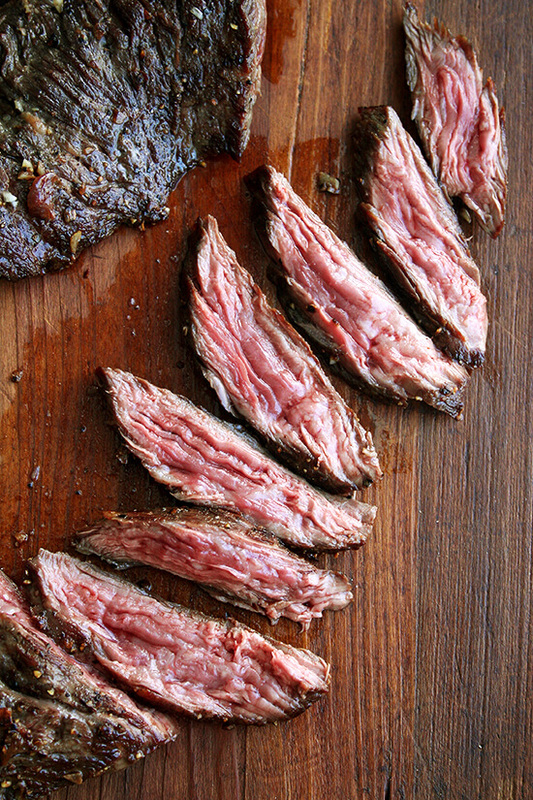 Flap steaks at their thickest are barely an inch thick. The original sauce recipe calls for chopped parsley at the end, which you could do, but I don’t find it to be necessary. 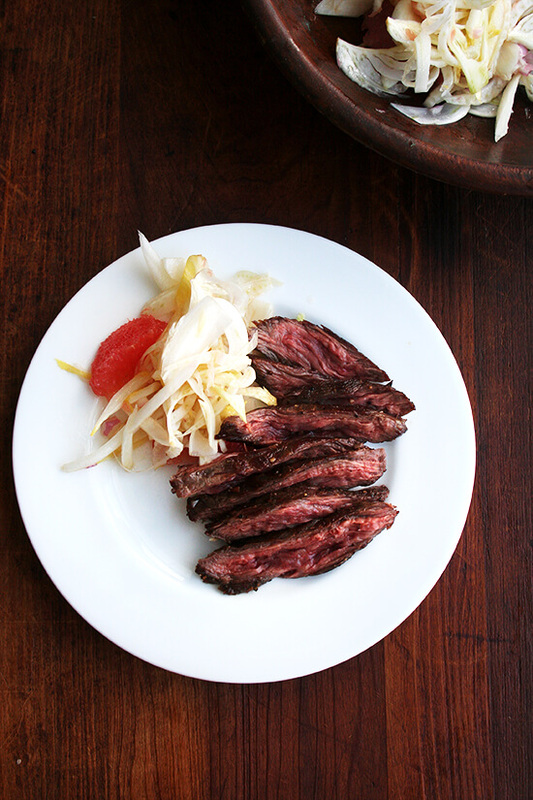 Hanger steak gets its name because it hangs from the diaphragm of the steer. It is also known as “the butcher’s steak” because allegedly it was the piece the butcher took home for himself and his family. As noted above, there is only one hanger (which can be cut into two pieces) per steer, and few markets carry it. If you live in the Schenectady area, you can order one from Bella Terra Farm — all of their meat is delicious. I’ve had their sausage, their skirt and hanger steaks. 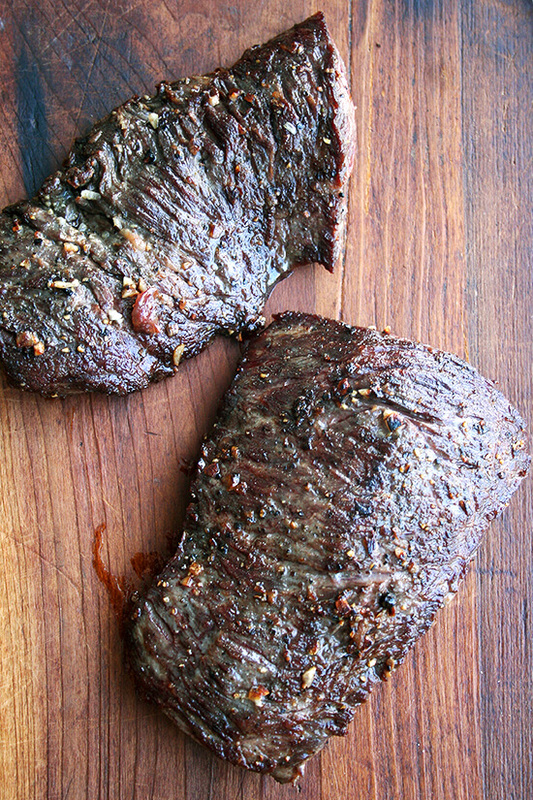 Again, skirt and flap steaks are great alternatives to hanger and are easier to find. 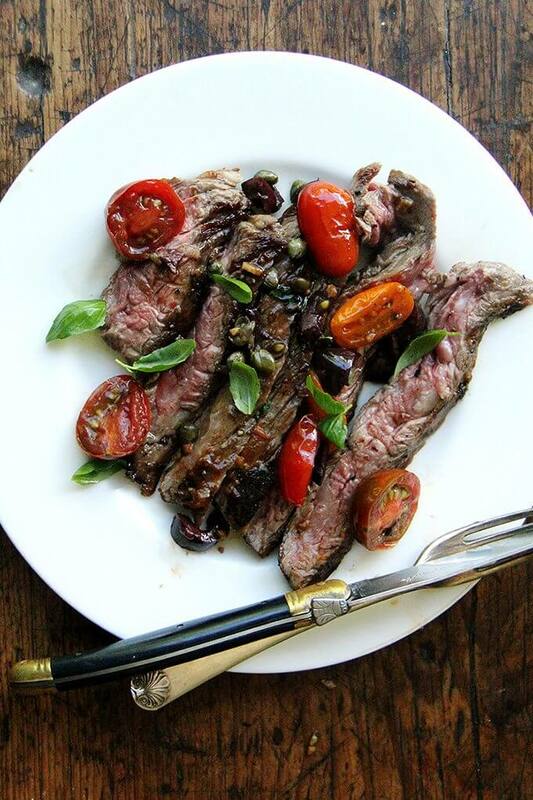 Healthy Living in Saratoga carries delicious grass-fed skirt steak from two local farms, Hardwick and Boyden. Remove the steaks from the fridge an hour (if time allows) before serving to ensure they are at room temperature before cooking. Season with salt and pepper on both sides. If your steaks are really long, cut the meat at the points where the thickness changes. This will leave you with several pieces each with a uniform thickness. Heat oil in a large heavy-bottomed skillet or sauté pan over high heat. 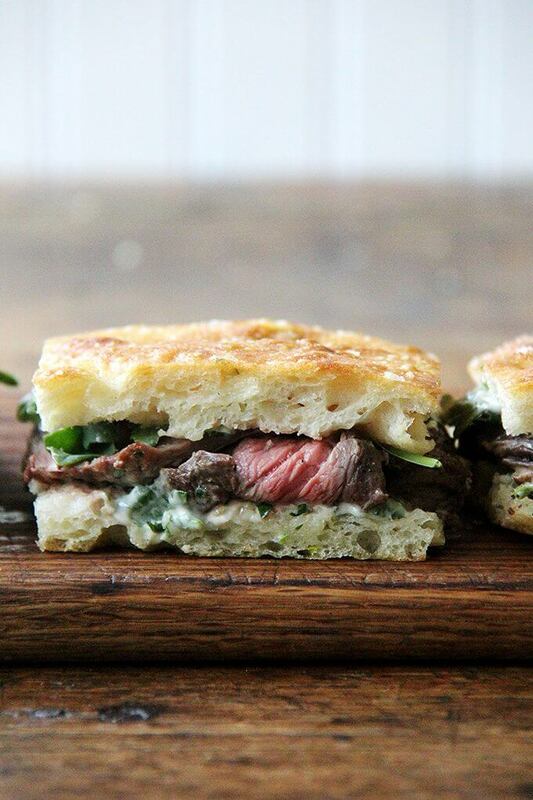 Pat the steaks dry with a paper towel — this will help them brown nicely. 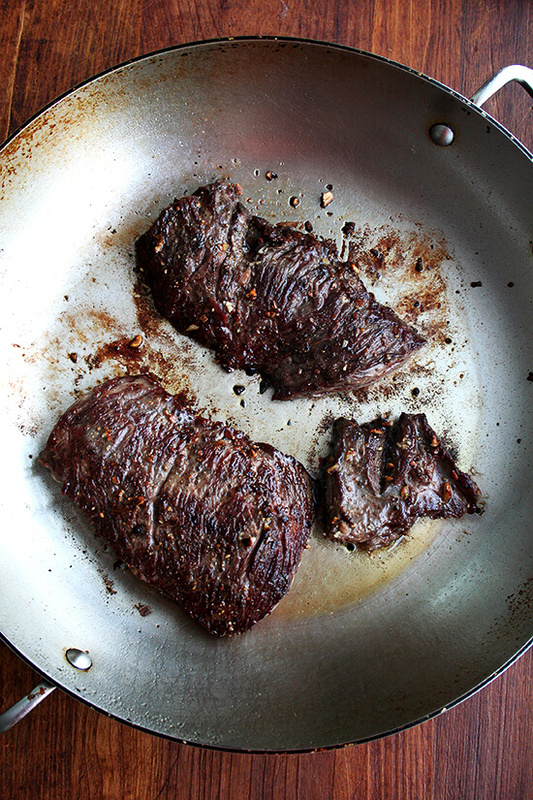 When the pan is hot, place the steaks into the pan, and reduce heat slightly (medium high to high is about right). For pieces that are about an inch thick, cook for three minutes a side. For pieces that are half an inch thick, cook two minutes a side. For thinner pieces, try two minutes on one side and maybe one to two minutes on the other side. These times are for steaks that will be medium-rare in doneness. Adjust times if you prefer a more well-done cooked steak. Remove steaks from pan, and let rest for 10 minutes. 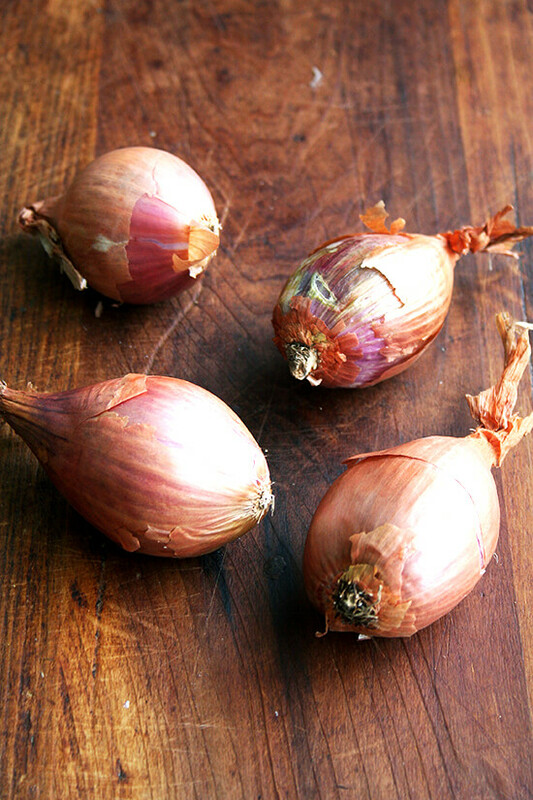 Reduce the heat to medium, add a tablespoon of butter and the shallots. Season with salt and pepper and cook, stirring frequently, until the shallots are soft but not colored, about 3 to 5 minutes. Add the vinegar and cook until it evaporates, then add the wine. Bring the wine to a boil and let it reduce by about half. Remove pan from heat and stir in the remaining tablespoon of butter. Transfer steaks to a cutting board. Pour the juices from the plate the steaks were resting on into the shallot sauce. Stir to combine. Slice steaks against the grain. 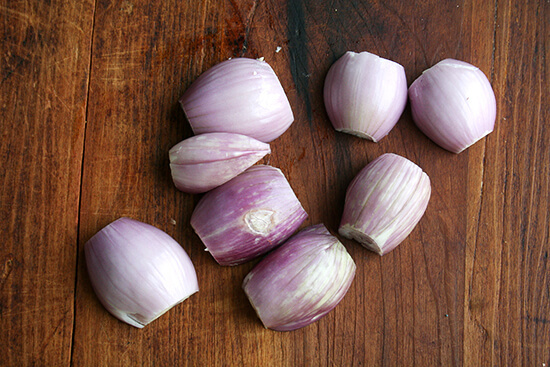 Serve with the warm shallot sauce over top. Oh my. I had reservation for Friday, but I’m thinking about cancelling 🙂 Looks so good! As always. Very interesting re flap steak. I always thought flap and hanger were the same, but I see now that they are not. I love skirt steak. This looks delicious! I just drooled on my keyboard a little bit. It’s too early to be thinking about dinner! Metropolitan chocolate cherry bread is my favorite this time of year! I used to live in old city not too far from one of the little metro shops. Love their granola too! My favorite blogger. Loved this post. A great read as always. Oh this sounds wonderful! The sauce! (The bread!) Love love the idea that this lands on the table so quickly and is a little elegant, too 🙂 If not tomorrow night, SOON! Hope you had a nice night out on the town, Sophie! Good luck with the shower today! 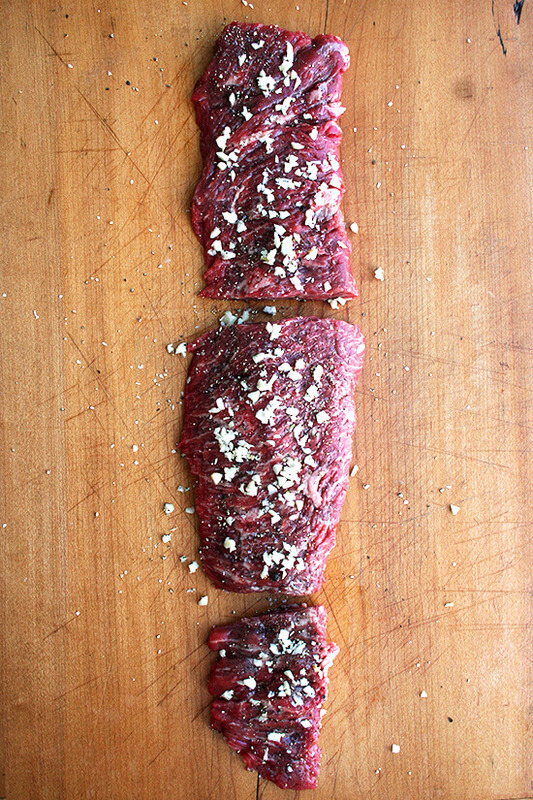 Cooking steak at home really intimates me; your recipes and photos make skirt steak look so approachable. I can’t wait to give this a try! definitely do! it’s so easy! And of course you get my vote! This is my favorite place to come for inspiration. Thanks so much, Andris! You are kind. ‘Made this yesterday and it was excellent, but not having a skirt steak went with a boneless ribeye, five-6 minutes per side in a hot pan. Great recipe for the pan sauce–it was amazing! yay! i’m so happy to hear this! Nice work on the ribeye. I do love a ribeye, too. ISn’t the sauce so simple? Hi, just wondering about the bread. I don’t have a dutch oven…(I know how is this possible). Can I just bake it the whole time on a baking sheet? It looks yummy! Heidi, I think you probably can. I would suggest baking two smaller loaves if you do this, and maybe preheating your baking sheet for awhile, too, just to help the loaves spring upward a little bit as they bake. Hope that helps! I ended up making this steak and salad for Valentine’s Day – though used a strip instead of skirt (strip was on sale at the butcher) – and it was really delicious. The salad was especially surprisingly tasty. Easy execution, too, which is always a plus. Thank you!! Wonderful to hear this, Kate! It’s hard to resist a strip on sale. So glad you liked the salad, too! Done and done. I can’t get that slow-cooked kale out of my head and will have to make it soon. Rooting for you! Thank you so much, Ileana. You are kind. Made this last night for dinner and it was so incredible. I was also intimidated about cooking red meat at home (especially since I don’t have a grill) and this was a perfect solution. The sauce was so simple and rich. Thanks for sharing this recipe! Your blog is my new favorite! Making the chocolate bread now. So happy to hear this, Marcy! Isn’t the sauce fun? 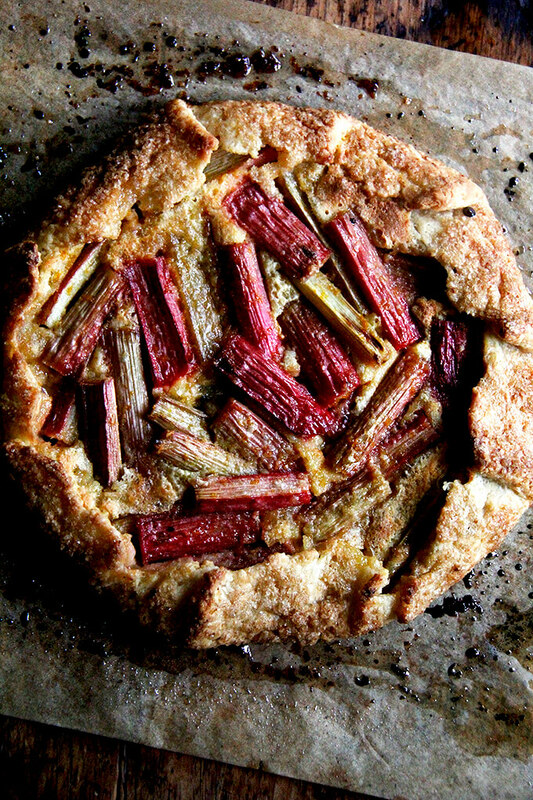 Simple, tasty, festive — I love this one. Thank you for your kind words. Stunning paintings! It seems that you cut your meat with the grain instead of across the grain which makes the meat more tender. Very interesting article! Thanks for sending. You are totally right, I did not cut across the grain, but with skirt and flap steaks, because of their long narrow shape, it’s kind of awkward not to cut with the grain. Does that make sense? Just cut in pieces (1/3rds) like you did to prepare then turn 90 degrees…voila then cut your slices…!! (learned that from A. 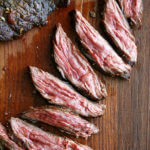 Brown on Good Eats years ago) Works like a charm, you will enjoy your flank and skirt steaks so much more! Ok. awesome, I’m going to try this! Thanks, Scott! I loved A. Brown, too, back in the day. Such a treasure. I’m so happy to hear this! You are inspiring me to make a loaf this weekend. Thank you for writing in (both here and on It’s not you, It’s Brie)!